In deciding what constitutes a reasonable period of absence, it is policy that a period of up to 3 months might be reasonable, given that this ties with the period that a 820 applicant would be given if they are eligible to be granted a Bridging B (WB020) visa (that is, a bridging visa with a travel facility that is available only to Bridging A visa holders who meet the relevant criteria for the grant of a WB020 visa). However, the 3-month period is a guide only and does not have to be applied rigidly. A shorter or longer period may be reasonable, depending on the individual circumstances of the case. if the applicant or their partner is attending an overseas training course or study, or has an overseas scholarship that does not allow them to return to Australia in the short term. In all circumstances, the 820 applicant may be asked to provide documentary evidence that they are unable to return to Australia in the short term. Partner Visa Sponsorship changes will not proceed as of the 1st July 2017. The new regulations proposed that partner visa sponsorship applications would need to be lodged under stricter criteria and approved before the overseas partner visa application could be lodged. 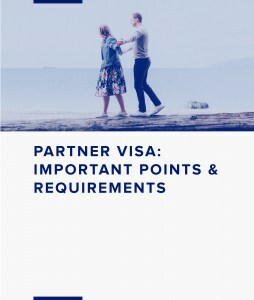 The new 2 step process is expected to delay the lodgement of the overseas partner application and require the overseas partner to have a valid visa until a visa application for the overseas partner can be lodged.The bill proposing the new regulations is currently before the Senate and as such has not been enacted. It is likely to not come into effect until 2018. We recommend that our clients take advantage of the deferral of the new regulation and lodge their sponsorship and partner visa application prior to the 2018 changes.